Made in the USA - These quality cast iron Farm Dinner Bells are the most versatile, low-priced bells we offer. They mount with 1 bolt, and may hang as shown or rotated to site atop a post. They are cast in the USA from the original old patterns, and have a powder coated finish, not painted. They come in only one size, not to big and not too small. 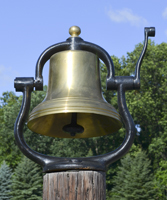 If an Antique iron bell is what you need, we have them in from time to time. Post bells can also be used indoors: you can mount a bell of this type by hanging it from a post attached to a ceiling beam. We sell a 14" bell in this configuration. 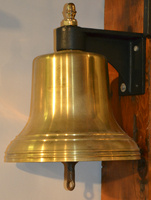 We now have PARTS for most post bells; we can sell you just the bell and clapper if you do not need a swinging bell. (517) 937 1517 - Fax (517) 592 4511 - Send Marc an Email. Entire Site © 2010 - 2017, Brosamer's Bells, Inc.